Did you know that when you visit a place that it gets even better when you learn about the cultural values people in this place have? Forget about the breath-taking scenery for a while. Talking to people about how they create income to make a living is a real eye opener and so much better than only reading about it in the papers. Engage with the local community and learn about their history. Visit locally owned bars, cafes, museums, and restaurants and empower the community economically. And while you are their guest, they most often will tell you all about the best places to visit, and soon you will know it all (if not all, at least a lot more than before). So far all people I met were even happy to tell me a little bit about the environmental and political issues they face in their country. You can’t open a magazine, without someone telling you from the pages that you need to use argan oil. Over the years more and more people go into raptures about argan oil, you should have heard my Scottish hairdresser in Melbourne soon after it started to become popular outside of Morocco. It is apparently great for your skin, for your hair, to put on salads, and as medicine ... I always had this vision to find out what all this talk is about. And now that I went to Morocco I eventually made my dream come true. In Essaouira a vendor at the souk, who sells scented mint, bundled into hundreds of bunches and stacked up the wall of the hall at the vegetable market, tells me that I simply have to drive a bit out of town (in my rental car) and I would find several producers where I can simply stop to have a chat. He doesn’t provide any address, he just tells me to drive out of town. That is exactly what I do and two of the ones I find soon after were so friendly to tell me about the argan tree, explain the production process, and to even show me around their premises …. It is a very warm day, the sky is blue, and there is not much wind. After a very short drive on unpaved ground away from the main road that connects Essaouira with Sidi Kaouki and as I park my car on the gravel I am greeted by the big brown eyes of a very inquisitive baby donkey on spindly legs with a thick fringe and long soft ears. I step out of the car, greet the wrinkly gentleman, sitting in the shade on a wooden chair next to the green iron gate, and make my way to the property. There is a friendly brown short haired but a bit ragged dog, which is looking down on me from the flat roof. Mr Dog barks twice, probably to tell his owners that there is a visitor. A second later a guy opens the door, stretches out his hand and asks me whether I am interested in argan oil. I am the only guest. I smile, nod and ask whether he might show me around. He smiles back, nods, and I can see he is just as delighted as I am. We stand in the low lit building, and the guy tells me that today the argan forests are on the UNESCO’s Man and Biosphere Programme, that works, to establish a basis for the improvement of relationships between people and their environments. The reserve is in the south-west of Morocco bordered by the Atlas Mountains and the Atlantic Ocean. 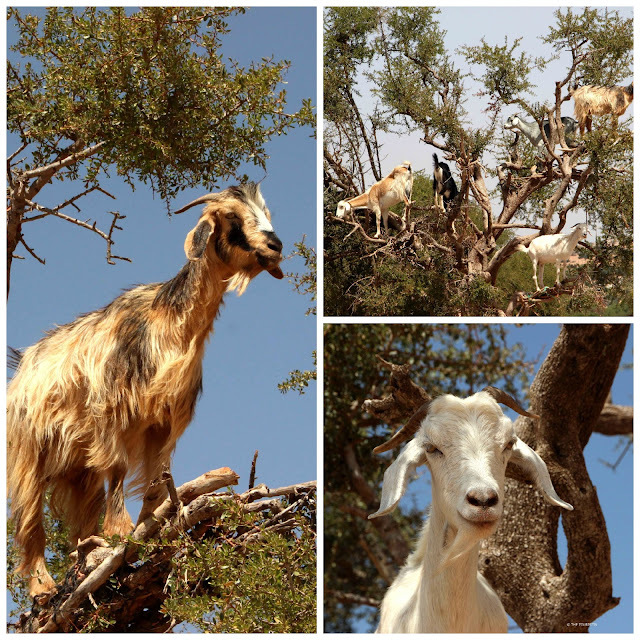 I learn that the argan tree is in need of conservation. The oil is produced from its nuts and because of the increased worldwide demand (you know your cuticles, your hair, your wrinkles, and the salad sauce), it plays an ever growing economic role in Morocco. Not only that, the trees also play a vital role in the protection of the environment, they can only protect fertile land from becoming desert area when the tree population remains healthy. The UNESCO biosphere reserve ensures replanting of the trees and supports initiatives that produce oil in the traditional way. Everybody is happy about it. And only in spring there was a conference in Marrakech to discuss what best to do in the future, and whether the use of renewable energy might be a smart thing to do. While we talk the man guides me to the electric stainless-steel argan oil press machine and explains how it works. Spick and span is best to describe this place. The kernels of the nuts are pressed, and the extracted oil gets filtered. The by-product, which looks like a thick beige-coloured nut mousse, gets collected in big sacks and will later get fed to the goats. Goats were an integral part of the whole process in the past. They climbed the thorny argan trees, they ate the fruits, they digested the thick skins, the kernels came out at their back end, and the results were collected. He tells me that today the farmers don’t want the goats to destroy the precious trees, and I ask the guy whether feeding them the nut mousse is a form of consolation. He smiles at me, mildly. Anyway, silly jokes aside, great to see that nothing goes to waste in this place. I get more intense looks from him, like he is waiting for a big reaction when he says that they need 30 kg of nuts to produce one litre of oil. A tree gets harvested once a year (whereby they only use the nuts that fell down) and gives approximately 75 kg of nuts. We go to a large room where ten Berber women sit against a red wall in a half moon circle on mats on the floor. They look up, only briefly and smile. We shyly wave each other before they swiftly continue cracking the dried nuts manually, with a big stone. They collect the kernels in a basket standing next to them. Their ever repeating tasks surely come with all the non-pleasures of assembly work, but creating products to sell on the national and international market generates income for the women. The L’Union des Coopératives des Femmes pour la production et la commercialisation de l’huile d’Argane (Union of Cooperatives of Women for the production and marketing of Argan oil) the cooperatives work with, aims to improve the socioeconomic conditions of the rural woman in the western region of southern Morocco. And at the end of our chat I am offered to try argan oil together with a piece of white bread with a thick crust, it goes well together, and I have to buy face oil and and cooking oil to take home with me. Not because my host wants me to buy it, and I feel I have to, but because I am so fascinated by all this …. And now I am also one of these people who highly recommend argan oil. Drive along the 2201 from Essaouira to Sidikouaki and look out for the signs that advertise argan oil cooperatives. Would you like to read more about Morocco? I wondered whether argan oil was just a passing fad until my sister gave me a bottle, and now I love it - it's really versatile (though I have yet to try it on my salad)! Nice to know it's also sustainable. Would love to hear more on your travels to Morocco. What a great experience (and post).